The English football champions are the winners of the highest league in English men's football, which since 1992–93 is the Premier League. Following the legalisation of professional football by the Football Association in 1885, the Football League was established in 1888, after a series of meetings initiated by Aston Villa director William McGregor. At the end of the 1888–89 season, Preston North End were the first club to be crowned champions after completing their fixtures unbeaten. Representing the first fully professional football competition in the world the league saw its early years dominated by teams from the North and Midlands, where professionalism was embraced more readily than in the South. Its status as the country's pre-eminent league was strengthened in 1892, when the rival Football Alliance was absorbed into the Football League. Former Alliance clubs comprised the bulk of a new Second Division, from which promotion to the top level could be gained. It was not until 1931 that a Southern club were crowned champions, when Herbert Chapman's Arsenal secured the title. Arsenal scored 127 goals in the process, a record for a title-winning side (though runners-up Aston Villa scored one goal more, a record for the top division). Leicester City celebrate winning the Premier League in the 2015–16 season. Following the legalisation of professional football by the Football Association in 1885, the Football League was established in 1888, after a series of meetings initiated by Aston Villa director William McGregor. At the end of the 1888–89 season, Preston North End were the first club to be crowned champions after completing their fixtures unbeaten. Representing the first fully professional football competition in the world the league saw its early years dominated by teams from the North and Midlands, where professionalism was embraced more readily than in the South. Its status as the country's pre-eminent league was strengthened in 1892, when the rival Football Alliance was absorbed into the Football League. Former Alliance clubs comprised the bulk of a new Second Division, from which promotion to the top level could be gained. It was not until 1931 that a Southern club were crowned champions, when Herbert Chapman's Arsenal secured the title. Arsenal scored 127 goals in the process, a record for a title-winning side (though runners-up Aston Villa scored one goal more, a record for the top division). Rules stipulating a maximum wage for players were abolished in 1961. This resulted in a shift of power towards bigger clubs. Financial considerations became an even bigger influence from 1992, when the teams then in the First Division defected to form the FA Premier League. This supplanted the Football League First Division as the highest level of football in England, and due to a series of progressively larger television contracts, put wealth into the hands of top flight clubs in a hitherto unprecedented manner. The first five champions in the Premier League era – Arsenal, Blackburn Rovers, Chelsea, Manchester City and Manchester United – had all won the title at least once prior to 1992. 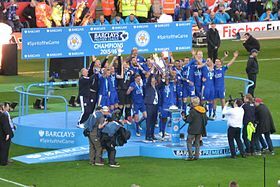 Leicester City were crowned champions for the first time in 2016, becoming the first (and to date only) team to win the Premier League without having previously won the First Division. Bold indicates double winners – i.e. League and Domestic (FA) or League (EFL) Cup winners OR League and UEFA Champions League or UEFA Europa League winners. Bold italic indicates treble winners – i.e. League, Domestic (FA) or League (EFL) Cup winners and UEFA Champions League or UEFA Europa League winners. There are 24 clubs who have won the English title. Teams in bold compete in the Premier League as of the 2018–19 season. a b Also won the UEFA Europa League. a b Also won the UEFA Champions League. a b c d e f g Also won the EFL Cup. a Also won the UEFA Cup Winners Cup. a In addition to the double of League and FA Cup, Manchester United also won the UEFA Champions League in 1999. This achievement is referred to as the Treble. "Past winners – The Football League". Football League website. Archived from the original on 17 July 2014. Retrieved 29 August 2008. "England – List of Champions". RSSSF. Retrieved 11 June 2009. ↑ Inglis, Simon (1988). League Football and the Men Who Made It. Willow Books. pp. 6–8. ISBN 978-0-00-218242-3. ↑ Titford, Roger (November 2005). "Football League, 1888–89". When Saturday Comes. Archived from the original on 29 May 2009. Retrieved 6 June 2009. ↑ "A History of The Premier League". Premier League. Archived from the original on 18 November 2011. Retrieved 7 June 2009.